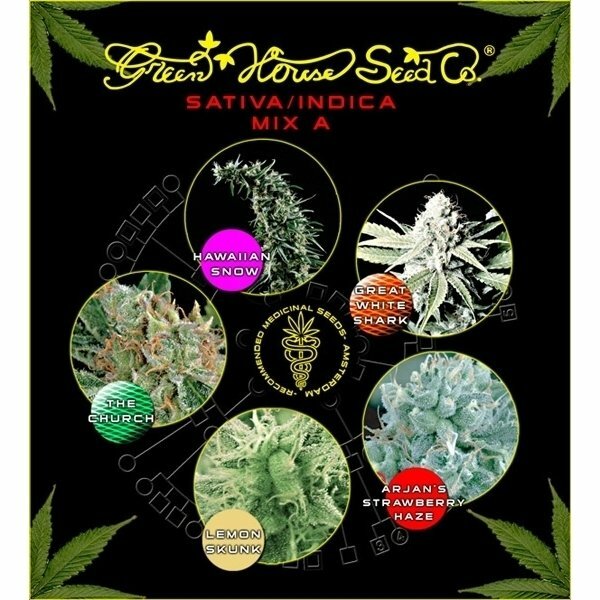 The Sativa/Indica Mix A by Greenhouse Seeds is a selection of five different medical cannabis varieties with different medicinal qualities. This is a great chance to grow and blend your own natural medicine. This mix contains: Arjan's Strawberry Haze, Great White Shark, Hawaiian Snow, Lemon Skunk, The Church. Available in packs of 5 and 10 seeds. 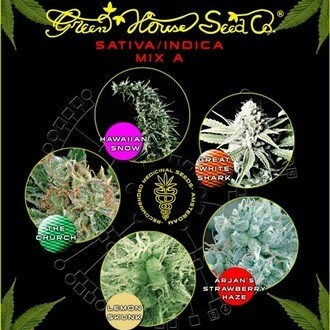 The Sativa/Indica Mix A by Greenhouse Seeds is a great selection of five very potent different medical cannabis strains with different medicinal qualities. If you ever wanted to grow and blend your own natural medicine - here is a great chance to give it a shot. Arjan's Strawberry Haze is a genetic blend of NL5 Haze Mist and an Indica/Sativa hybrid from Switzerland called "Erdbeer" (German for Strawberry). She is a rather tall plant with long branches, but a rather short flowering period for a mostly Sativa strain. Arjan's Strawberry Haze responds very well to LST (Low Stress Training) and is a perfect candidate for the ScrOG method in which she can yield up to 600g/m². The very high THC level of 20% and the low levels of both CBD and CBN form a cannabinoid composition, which translates to an uplifting and inspiring cerebral high, accompanied by only very mild physical effects. Looking at the name there is little space for guessing; Great White Shark is obviously another member of the "White" family. Actually she has been created by crossing Super Skunk with White Widow (Brazilian x South Indian). Great White Shark develops its large and super resinous buds within a relatively short flowering period of 9 weeks and produces yields of up to 800g/m². The THC level of 14% may appear rather moderate, but she boasts with 1.7% CBD and 0.8% CBN and is therefore perfectly suited as a means for battling pain and as a sleeping aid. Hawaiian Snow has won multiple awards and boasts with a very high amount of THC in the properly cured end product - incredible 23%! She calls for a patient grower for she requires 12 weeks to finish flowering, but the yield makes up for the long wait. Reared indoors you can expect yields in the range of 600-700g/m². Hawaiian Snow is a tall plant with long branches and produces buds that become so heavy at the end of the flowering period, that the branches need some kind of support. This stuff causes a slowly-onsetting, but long-lasting high, that elevates the mood and inspires to get something done. Lemon Skunk is a highly aromatic and very potent variety - she is the offspring of Skunk and Citral. In an indoor setup it is possible to achieve yields of up to 800g/m² after a flowering time of 8-10 weeks. Lemon Skunk weed with its 19% THC, around 0.2% CBD and a CBN level of roughly 0.7% is a good choice for patients suffering from anxiety, depression, arthritis and chronic pain. The high of this variety is characterized by a slow onset, it starts in your eyes, before flooding the brain and minutes later you are in a state of fearless euphoria. Once the initial cerebral inebriation tapered off a bit, the experience becomes enhanced by a pleasant body relaxation. The Church is based on Super Skunk, Northern Lights and a Swiss Indica/Sativa hybrid named "Erdbeer" (German for strawberry). Brought up in an indoor setup she requires 8 weeks of flowering to produce a yield of up to 800g/m². But this is not only a high yielding, but also very potent variety - 20% THC is far from miserly. This is the perfect weed for a funny get-together with buddies or to fight depression or anxiety, for the induced high is very social and motivating. Savored in higher quantities the high becomes more and more trippy.